And on the cultural front, a new photo exhibition opened this Tuesday in Seoul. It features the works of U.S. photographer Jordan Matter, who first gained worldwide recognition for his project called, "Dancers Among Us." In just over one minute, this video by Nathan Taylor captures the energy and excitement of my recent trip to Chicago. And there's a Dancers Among us shoot with Steffi Cheong, Marissa Horton and Angelica Garza! Footage shot by various volunteers around the country, set to maybe my favorite rock and roll duet ever. This video has been viewed over 60,000 times! Let's keep that number climbing! Go behind the scenes of the special Dancers Among Us photo shoot at the Pillow with Jordan Matter Photography, Michaela DePrince, and Skyler Maxey-Wert! Go behind the scenes with Jordan at the 2013 Fall for Dance photo shoot. Featuring dancers from Paul Taylor Dance Company, Ballet Hispanico, Streb, and Dance Theatre of Harlem. Filmed by DancePulp. Check out this incredible behind the scenes video capturing an amazing night of Jordan Matter photographing STREB EXTREME ACTION in front of the Grace Building in New York City on May 7. Presented by Arts Brookfield, the night's festivities also included a Dancers Among Us photo and video slideshow, and a raffle of prints and books. Here's a fun video of my trip to Paris with Houston Ballet, including the first glimpse of many new photos. French photographer Gin Pineau (ginibee.fr) saw my post on Facebook last fall and asked if she could bring her camera and observe our shoot, and then she put together this awesome video. After Superstorm Sandy, there were countless images of loss and devastation, but photographer Jordan Matter's portraits of the people who call the Jersey Shore home tell the true story of the resiliency of the seaside community. "Dancers are the ideal people to photograph- they're beautiful, collaborative, artistic, expressive, and, most importantly, they love what they do. For three years, I've worked with people who inspire me every day." Check out this incredible behind-the-scenes video that dance lifestyle channel DS2DIO put together with dance superstars Chachi Gonzales and Ian Eastwood! Happy Holidays from Dancers Among Us! 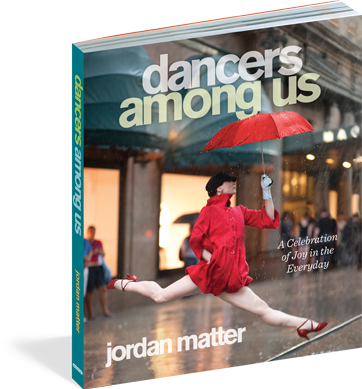 Dancers Among Us is a New York Times best selling book that was selected by Oprah Magazine, Amazon and Barnes & Noble as one of the Best Books of 2012. Thanks to Caleb Custer for this fun behind-the-scenes video starring Alvin Ailey American Dance Theater dancer Michael F. McBride and So You Think You Can Dance star Ellenore Scott. Shot around New York City. Brave dancers from Sarasota Ballet are under attack by ravenous birds on America's #1 beach- Siesta Beach in Sarasota, FL. This hi definition video was created by Pamela Bob with her iPhone! Behind the scenes footage of dancer Erin Clyne "jogging" across the Nortwestern Metra Line tracks. This video by Travis Francis shows the behind the scenes secrets of a dancer levitating over the bay. Featuring dancers Lloyd Knight, Eric Bourne and Dayla Perkins. Filmed in New Rochelle, NY. Dancers Among Us proves that it's not always raining in Seattle - sometimes it's snowing! Dancers Among Us: in Atlanta for some southern hospitality and refreshing sweet tea. Thanks to Will Day for the incredible video, Jacob Bush, Alessa Rogers, Pablo Sanchez, Rachel Van Buskirk of Atlanta Ballet for their fantastic contributions to Dancers Among Us in Georgia, and Claire Stallman for taking one for the team. Dancers Among Us: in Harlem The first in a series of "be ALIVE" videos, featuring Michael McBride, a dancer with Alvin Ailey American Dance Theater. Dancers Among Us: in Chinatown The second in a series of "be ALIVE" videos, featuring Broadway dancer Heather Lang of Spiderman. Dancers Among Us: on Wall St. The third in a series of "be ALIVE" videos, featuring AdeChike Torbert, finalist on the FOX show, So You Think You Can Dance. Jordan and dancer Jessica Deahr improvise their way to the perfect sunrise shot. Here's a video created by the NY Daily News. To view the full profile, click here.